Opera today released the state of mobile web report which found that Facebook usage by Mobile users has jumped over 600% compared to last to become the most popular Mobile social network. Unique users of Facebook grew more than 600% during 2009, helping the site surpass VKontakte, formerly the most popular social network among Opera Mini users. These numbers and findings are based on Mobile Opera browser users only, which is the most popular mobile web browser. Gmail fell off the top 10 list, allowing Facebook, Wikipedia, Yahoo!, and YouTube to move up the list. Cricinfo is a new addition to the top 10 list. If you ware wondering how did Gmail fall off the top 10 list, its simple – Google introduced push email feature few months back and that allowed users to check mail without the browser. WoW ! like previous years, Nokia just rules the roost, all 10 mobile phone handsets used by Indians are Nokia ! Facebook has got uber-popular over last couple of years – Last year it great 619% to take the top position. 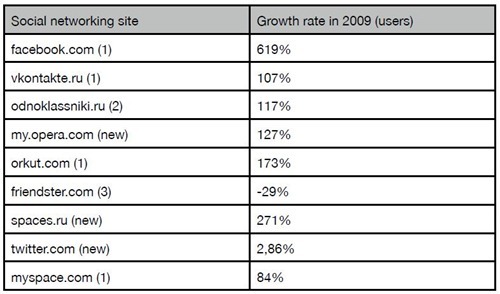 Except Friendster, all other sites have shown good growth amongst Mobile users ! Even though, Facebook grew around 430% as compared to Orkut’s 189%, but still the latter currently commands first position. Peperonity and mocoscape come in at number 3 and 4 ! Top 100 Global Business Schools – ISB only Indian B-School to feature at 12th ! WhatsApp Business App Now Live with APK File – Everything You Need to Know! which city in india usage most Internet ? Interesting point in the report – Even combodia and laos are ahead of India in terms of number of users…we have a looooooong way to go yet! Any idea of: Mobile internet traffic Vs. PC internet traffic in India? Its somewhat different in the global report, Twitter was the most visited mobile site and facebook was the most popular social site in PCs. I many Indians still haven’t witnessed anything cool in Twitter.